An activist who made undercover videos of ACORN is one of four men charged in the infiltration of Sen. Mary Landrieu's office. 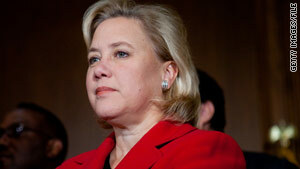 (CNN) -- A conservative activist who made undercover videos of the liberal community-organizing group ACORN was one of four men charged Tuesday with attempting to illegally access and manipulate the phone system in a district office of U.S. Sen. Mary Landrieu of Louisiana. Joseph Basel, 24; Robert Flanagan, 24; James O'Keefe, 25; and Stan Dai, 24, were charged with entering Landrieu's New Orleans office under "false pretenses for the purpose of committing a felony," according to a news release from the local U.S. attorney's office. The office is federal property. The four posted a $10,000 unsecured bond and were released, said Kathy English of the Department of Justice. According to CNN affiliate WWL, the next court date in the case is set for February 12. O'Keefe is the same activist who dressed up as a pimp last summer and visited ACORN offices to solicit advice on setting up a brothel, among other scenarios, law enforcement officials confirmed. He secretly recorded the visits on videotapes that were posted on the Internet, leading to a media firestorm. Flanagan is the son of William Flanagan, the acting U.S. attorney for the Western District of Louisiana, his office said. Articles on conservative Web sites connect O'Keefe to a man named Joe Basel, describing them as conservative student activists and filmmakers. This is a very unusual situation and somewhat unsettling for me and my staff. "This is a very unusual situation and somewhat unsettling for me and my staff," Landrieu said in a statement Tuesday night. "The individuals responsible have been charged with entering federal property under false pretenses for the purposes of committing a felony. I am as interested as everyone else about their motives and purpose, which I hope will become clear as the investigation moves forward." Louisiana Democratic Party Chair Michael McHale, in a separate statement, called the case a "Louisiana Watergate." "Louisiana families are shocked and outraged that these men would break the law to carry out their political agenda with this Watergate-like break-in and attempted wiretapping," McHale said in the statement, which also claimed Louisiana Republican Sen. David Vitter has "ties to some of the players involved" and called on Vitter to "immediately denounce" the suspects and anyone else involved. According to the news release Tuesday and an affidavit by FBI Special Agent Steven Rayes, who is based in New Orleans, Basel and Flanagan attempted to gain access to Landrieu's office Monday while posing as telephone repairmen. The two men were "each dressed in blue denim pants, a blue work shirt, a light green fluorescent vest, a tool belt and a construction-style hard hat when they entered the Hale Boggs Federal Building," the release noted. After they entered the building, the two men told a staffer in Landrieu's office they were telephone repairmen, according to the release and Rayes' affidavit. They asked for -- and were granted -- access to the reception desk's phone system. O'Keefe, who had been waiting in the office before the pair arrived, recorded their actions with a cell phone, said the affidavit by Rayes. Flanagan and Basel later requested access to a telephone closet, claiming they needed to perform work on the main phone system, the release and affidavit stated. According to Rayes' affidavit, the two men went to a U.S. General Services Administration office on another floor and requested access to the main phone system. A GSA employee then asked for their credentials, and the two men said they left them in their vehicle, the affidavit said. All four men have admitted their roles in the operation to federal agents, Rayes' affidavit said. If convicted, the four men would each face a possible maximum penalty of a $250,000 fine and 10 years in prison, according to the news release. Edward Castaing, an attorney who represented O'Keefe, Basel and Dai at Tuesday's hearing, refused to tell reporters how he got involved, WWL reported. Videotape of an interview with Castaing showed him respond "I have no idea at this point" when asked who was paying for his services. Castaing also said he gave them $60 to catch a taxi to retrieve their belongings after their release. O'Keefe and a female associate were named in a lawsuit filed January 21 by an ACORN worker in Philadelphia, Pennsylvania, who accused them of illegally videotaping an interview with her last July and distributing it on the Internet. That video and others by O'Keefe and his associate led to the dismissal of four ACORN employees who appeared to offer advice to the couple and to federal legislation barring the group from receiving federal funds. But a review by former Massachusetts Attorney General Scott Harshbarger, who was hired by ACORN to examine the issue, found no wrongdoing by ACORN employees. "While some of the advice and counsel given by ACORN employees and volunteers was clearly inappropriate and unprofessional, we did not find a pattern of intentional, illegal conduct by ACORN staff," Harshbarger's report concluded. "In fact, there is no evidence that action, illegal or otherwise, was taken by any ACORN employee on behalf of the videographers." ACORN, the Association of Community Organizations for Reform Now, was founded in 1970 to help the poor find government benefits and housing, but it became the focus of conservative complaints as a result of its voter registration drives. Articles posted January 14 on CampusReform.org and Political Vanguard, both conservative Web sites, quoted O'Keefe and a man identified as Joe Basel as conservative student activists and independent filmmakers. "Don't just respond to news, but actually create your own headlines," O'Keefe is quoted as saying by CampusReform.org. CNN Justice Producer Terry Frieden contributed to this report.